Having little boys we've come to love construction. It probably helps that Daddy is a plumber and has worked with just about every type of construction vehicle there is. In fact we showed him the different machinery while reading this book and he confirmed that he has driven them all. We have been to a local amusement park in NJ called Diggerland that lets you drive and use the real equipment - which all my boys loved. 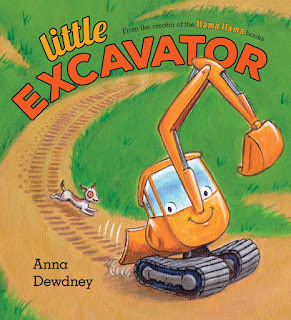 When I saw the new book - Little Excavator by Anna Dewdney - I knew it would be a wonderful addition to our library. This book is from the creator of the Llama Llama books. 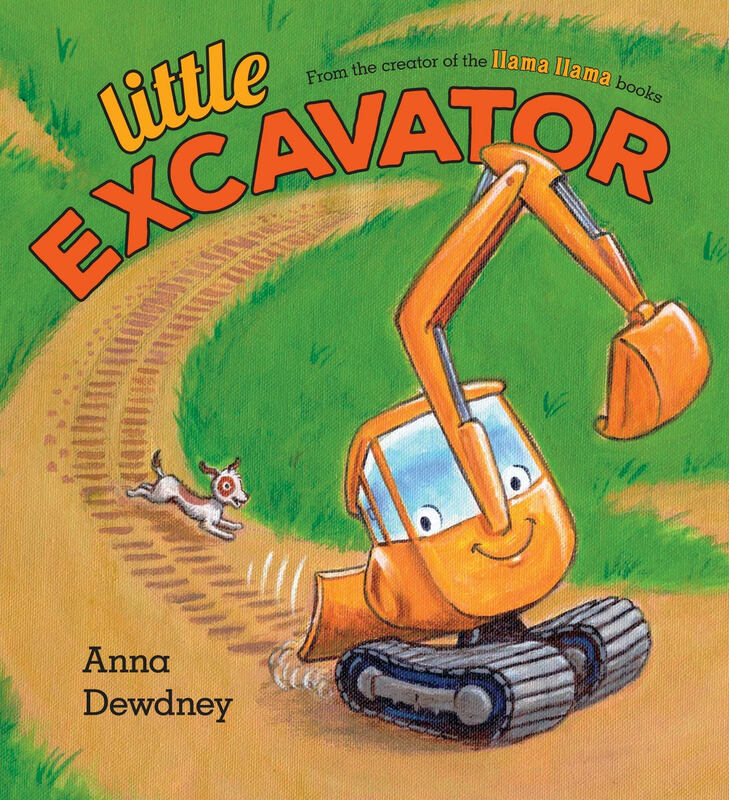 It features a small guy - Little Excavator who is trying to find his place on the job site. The book is a sweet story of fitting in. Lots of sounds and repetition make for a wonderful and engaging read. In the end Little Excavator finds his role and learns even little guys can help. I love that message since we have some big guys (our teens) and our six year old often feels too small to make any difference. We've been encouraging him to help when he can and this story just reaffirmed that message! The Big Rigs are working hard at the construction site when Little Excavator rolls up, eager to help. But Little Excavator isn't big enough to CHUG CHUG CHUG! like the Dump Truck as it loads dirt to lug or MOUND MOUND MOUND! like the 'Dozer as it pushes up the ground. Little Excavator wants to smooth out bumps and dig up dirt, but he is just too small. As Big Rigs around him WORK WORK WORK! they finally find a job that no other machine can do...except for Little Excavator! My guys love trucks, construction vehicles and tools of all kinds. They will love reading this book! This book is adorable for the little ones. And what little boy doesn't love trucks ? Or big boy for that matter. My grandsons would love the book. I love the art work in this book it reminds me of the ones I read over 50 years ago my little nephew would love reading this one. It looks like a cute kids book mine would enjoy.